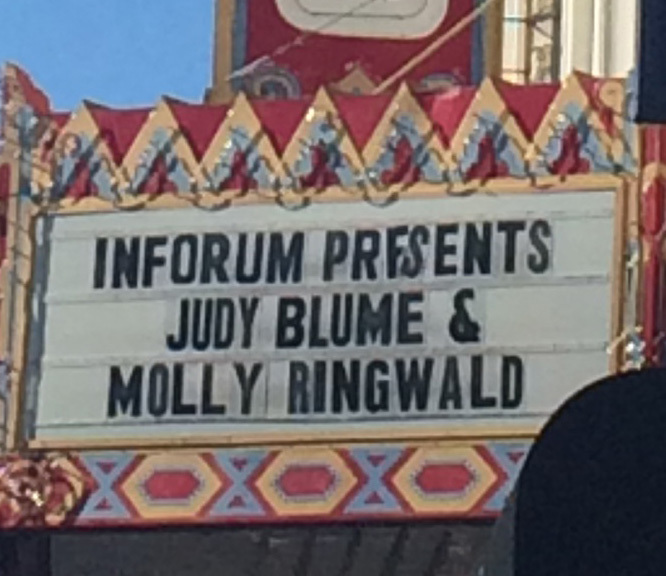 It's hard to think of two people more influential to the formative years of Generation X than Judy Blume and Molly Ringwald, which is why seeing them in person at the same time seemed almost surreal to many of us who got to be there for the event. On Sunday, June 7th, at the Castro Theater in San Francisco, over a thousand of us came to see Molly ask questions of Judy in a sort of interview-style format, as well as tell her own stories. The theater was full of mostly Gen X women and the event was hosted by Inforum (part of the Commonwealth Club) - an organization that works to connect the Bay Area's most interesting people to thought leaders in tech, pop culture, politics, food, and business. Inforum is about creating meaningful conversations and inspiring action, and their mission is similar to that of TEDx. 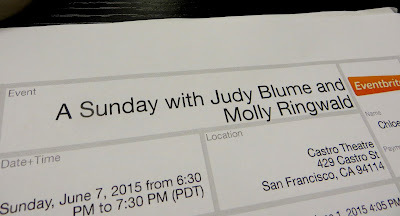 This was one leg of Judy's book tour for her newest book, In the Unlikely Event. She did months of research to create a historical fiction novel based on three plane crashes that occurred almost back-to-back in the early 1950s, and how the lives of three generations of families, friends, and strangers were profoundly changed by these events. Judy started her writing career in 1969 and she has written for every age. While the evening was in part about her new book, it was about all the writing she has done over the years and how it has affected people. Molly had some beautiful words to share about being affected by Judy's writing, especially when she gave an introduction about Judy, and I'm pretty sure just about all 1300 of us were shedding a tear as she said those sweet words. Both Judy and Molly have affected a lot of people through film and writing as they showed us we were not alone through the transitions of life - especially the transition of adolescence. Molly said that she was one of the only teenagers of the 80s who didn't have The Breakfast Club to guide her since the experience of being in the movie was different than watching it. On that same note, she was curious about who Judy had to guide her. Judy said that she quickly made her way through childhood books and was soon reading all the books on her parents' bookshelves. 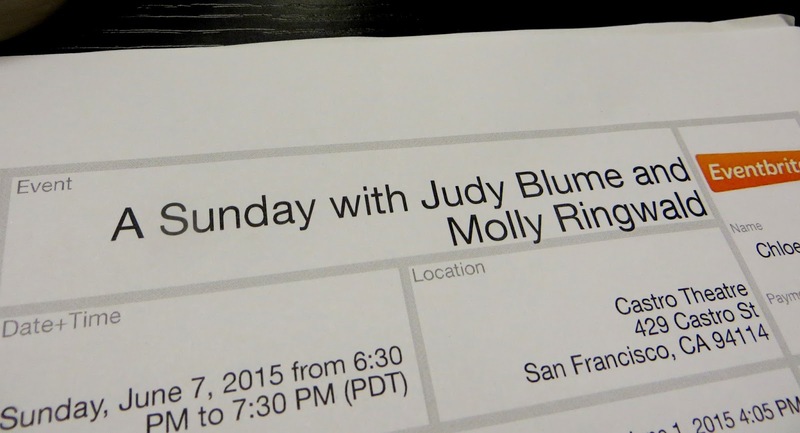 The first Judy Blume book that Molly ever read is, Are You There God? It's Me, Margaret. 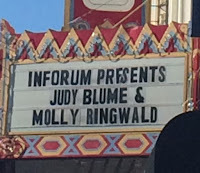 Molly spoke on behalf of all the girls over the decades who have been comforted by how Judy was able to write with honesty and candor about adolescence with a remarkable lack of shame. She spoke about how Judy wrote about all these issues with humor and grace - things that we are "not supposed to talk about" and that she has been a guide to many who would have otherwise been taught to approach these issues with embarrassment. They also talked about censorship issues - it was interesting to find out that Judy never experienced her books getting banned (or challenged as she prefers to call it!) until 1980. The 70s were a much different decade than the 80s and Judy's books were treated differently as the ideals of one decade made way for the ideals of the next one. I loved finding out during the talk that Judy had done one of the same things in her childhood as I did in mine. Because her teachers didn't respond favorably to reports on the sophisticated/advanced adult reading she was doing, when it was time to do book reports for school, she would make up books that didn't really exist along with authors that didn't really exist. I used to do this, too...only Judy used to get As on her fake book reports and I was more likely to get a C+! I forget how loud my laugh is when I find something deeply funny. It sort of explodes from my vocal cords and the sound waves can fill up a very large space. Sometimes it causes people to look at me quizzically. This explosive laughter is what I spent a lot of time doing when I read the books Judy wrote for elementary school kids - Tales of a Fourth Grade Nothing, Superfudge, and others. As Judy said many funny things through the evening, she looked over at me because of that loud laugh of mine and it seemed fitting, since it was her humor that caused me to laugh explosively in my childhood, it seemed fitting that she could hear it in real life. I somehow made my way up to the stage right after the show ended and called Molly's name a couple of times, but she didn't hear me. It was her adorable daughter Mathilda who noticed me and got her mom's attention to point her in my direction. 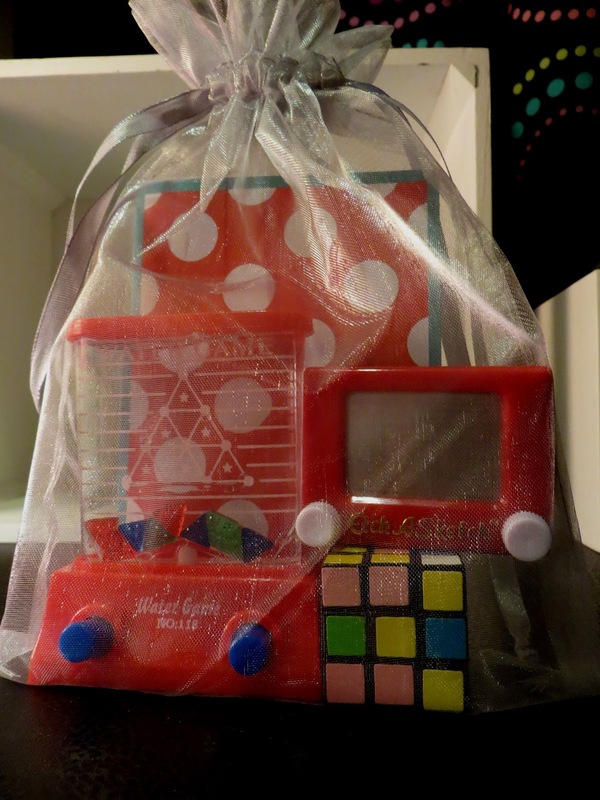 I had the chance to give Molly the gift I brought for her - three miniatures of toys from our Gen X childhoods along with a card. The stage lights were flooding down so brightly that I could really only just see her eyes and her signature smile as we very briefly spoke. She gives off the vibe of a truly kindhearted person. What I learned from Judy and Molly is that we should always be kind to one another, and more specifically, that we can better do that when we first have the confidence to love ourselves for who we are. Both Judy and Molly are examples of kindness, and that is clear by the way they treat the people around them. 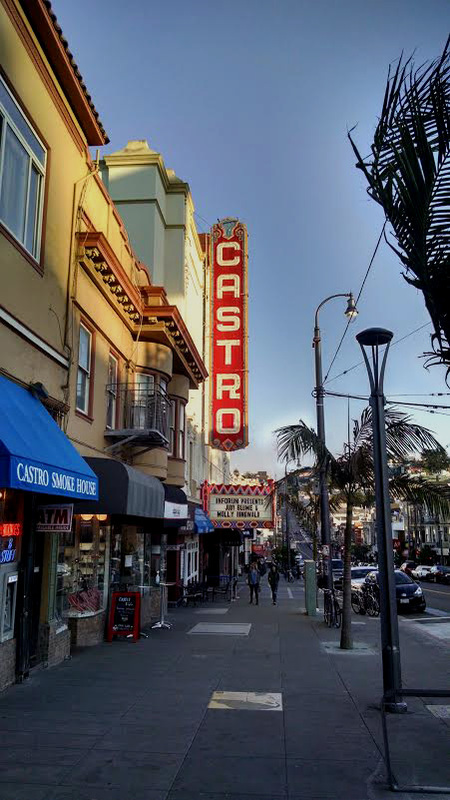 Rachel Maddow, when speaking at an Inforum conference described San Francisco as the only city that is truly magical. That evening I got to experience some of that. It was in the room that night as we all listened to Molly and Judy, it was on the streets as we all came pouring out of the theater. The palm trees leaned quietly over us as fog and a chilly dusk began to take over the blue sky. We walked back into the world, away from the profound experience of being in the same room as these two women, who are truly legends of their own time. Judy's first adult novel in 16 years, In the Unlikely Event is a book I can't wait to read because the novel is based on real life events and history that Judy researched through old newspapers and even the memories of old friends. It is a story of tragedy, loss, and hope, and how one generation reminds another that life goes on. Molly's first acting opportunity was in San Francisco when she was 10 when she was in the play Annie. She then went on to TV, to John Hughes films, then to foreign films. She isn't just an actor, she is also a published writer, and not everyone knows that she is even a talented jazz singer.